The oldest forms of indigenous shelter were often round in shape. (Think the Southwest USA Hogan, Mongolian Yurt, North American Teepee and the Greek Tenemos, among others.) Why did our ancestors choose to build round? Because the ovid shape — eggs, earth, tree trunks, and stones — is what they saw reflected in the surrounding natural environment. And, as usual, Mother Nature knows best. There is some nifty natural science that makes round buildings more comfortable, more energy-efficient and safer — especially if you combine the ancient shape with modern materials. Wind and tsunami waves move naturally around a round building rather than getting caught at (and potentially ripping off) corners. A rounded roof avoids ‘air-planing’- a situation where a strong wind lifts the roof structure up and off of the building. There are dozens of interconnected points in a round home. These are sites where builders can connect parts of the building together. In the olden days, the connecting materials were rope, vine and hides. Modern materials are engineered components- like a center radial steel ring, steel brackets, Seismic and hurricane ties, bolts and steel cables. These connect the structural pieces and give the building a unique combination of flexibility and strength- qualities which causes them to be significantly safer in severe weather conditions like earth quakes, extreme winds and heavy snow­fall. The roof structure incorporates a unique architectural design that has its origins in the mountain steppes of Central Asia. Roof trusses meet in a center ring, producing inward and outward pressure which holds the roof in a state of compression. 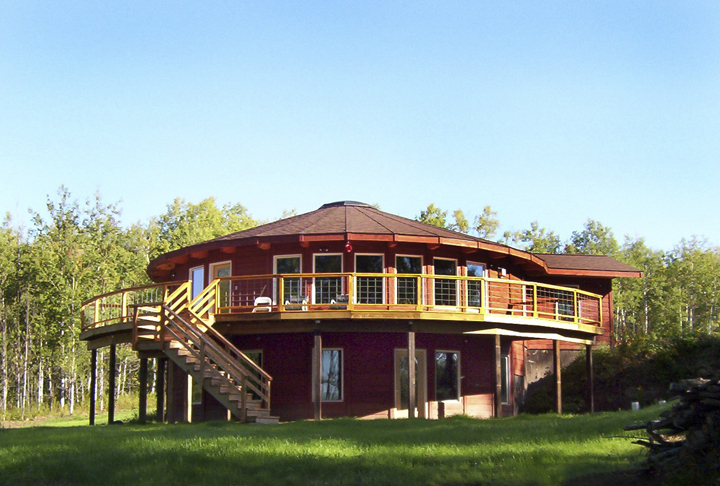 In modern round buildings using the ancient Yurt design, 1-3 airplane grade steel cables circle the outer perimeter where the trusses meet the wall and hold the natural outward thrust. Because of this combination of a central compression ring at the top of the roof and the encircling cables where the roof meets the walls, long roof spans are possible without any internal support system (like beams or posts). The interconnected tension in the building goes all the way to the ground and uses gravity and compression to hold it together with incredible strength. The natural ther­mal dynam­ics of open-at-the-top architecture round space uses no external energy to circulate temperature. It works like this; heated air naturally rises till it reaches the insulated ceiling, it moves up the domed ceiling till it reaches the center skylight, which is cooler, the air reacts by dropping to the floor where it moves across to the walls and rises again till it meets the skylight and drops again. This action constantly circulates the air and temperatures in the home. Round buildings use less wall, floor and roof mate­ri­als to enclose the same square footage as a rec­tan­gu­lar struc­ture. 15 to 20% less mate­r­ial is used to cre­ate the same square foot build­ing com­pared to a rec­tan­gu­lar design! This means the possibility for a smaller eco-footprint and more living space for less cost. It also means less sur­face area in con­tact with adverse weather con­di­tions, which improves the over­all dura­bil­ity and energy effi­ciency of the home. The acoustics of round space can be out of this world. The curve soft­ens the sounds inside the build­ing mak­ing it the per­fect place for rest and reflec­tion or for social­iz­ing and lis­ten­ing to and play­ing music (…think long winter evenings of storytelling around the central fire….) The shape also pre­vents noise from pen­e­trat­ing in from the out­side. Sound waves dis­si­pate as they wrap around the build­ing, shield­ing the interior from loud out­side noise. Our ancestors also understood a round home quality that is less measurable than the intelligent use of energy, the clever space allocation and the powerful and natural movement of air and sound. 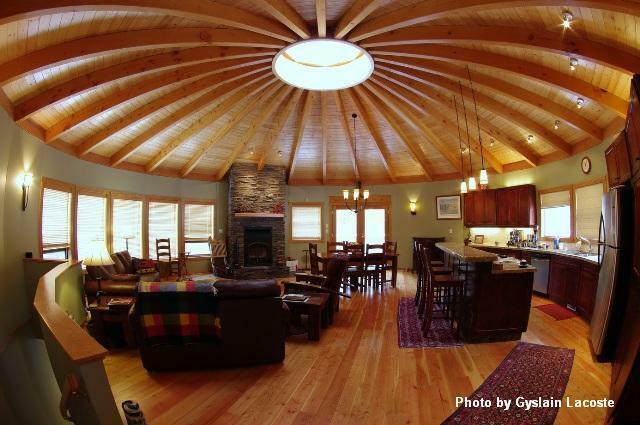 David Raitt, yurt builder, describes it “Circular living provides a balance of looking inward and outward, looking out at the natural environment and surroundings but then coming in again to the self and the hearth.” You might call it curve appeal. A 21st century home built with modern materials can be a safe, energy efficient , healthy-living-by-design House of the Future that Comes from the Past! TK, I'm not the only one who's designed structures with rectilinear floorplans & appropriate roofs for Class 5 disaster zones (seismic/volcanic) that require minimal, light-weight yet highly effective, durable structural systems. There are certain seismic wave-forms that will destroy almost any structure, even a spherical or cylindrical nuke-power containment vessel. Using a simple, well-designed post+beam or pole-frame structural system skinned with wire or EMM lathe AND fiber-reinforced Next-Gen plaster and loose-fill super-insulation, a "square" home can have ideal energy efficiency, economy, livability, and if it cracks or fails in an earthquake, it will do less harm than a heavier structure, and be easier (cheaper) to repair. BTW, some of the oldest buildings in California's San Andreas Fault quake zone are "square" adobe church's (about 400 years old) with pole-frame structural systems. Yep, they have been cracked but, instead of trying to resist overwhelming forces with cross bracing & steel ties, the old pole-frame structure flexes instead of breaking. Thus, CA structural plan checkers will swiftly stamp a well spec'ed pole-frame design. Best of fortune, etc. With modern structural materials & techniques, nearly round polygon floor-plan--with 9 or more sides--will perform almost exactly as well as a rounder structure. More importantly, it can more easily accommodate modern furnishings and life-styles evolved over thousands of years--even among the Hopi, Navajo, Aztecs, Maya, Inca, and many ancient cultures of Africa, the Middle East, and Asia. Also, virtually all homes would be better off being built into or under the ground, especially in this era of increasingly unsustainable energy-use, radical climate change, ever more radioactive fallout, etc. Most importantly, it's much easier to change the shape of a home than it is to change the enculturated social psychology, esthetics, and subconscious norms of human beings. 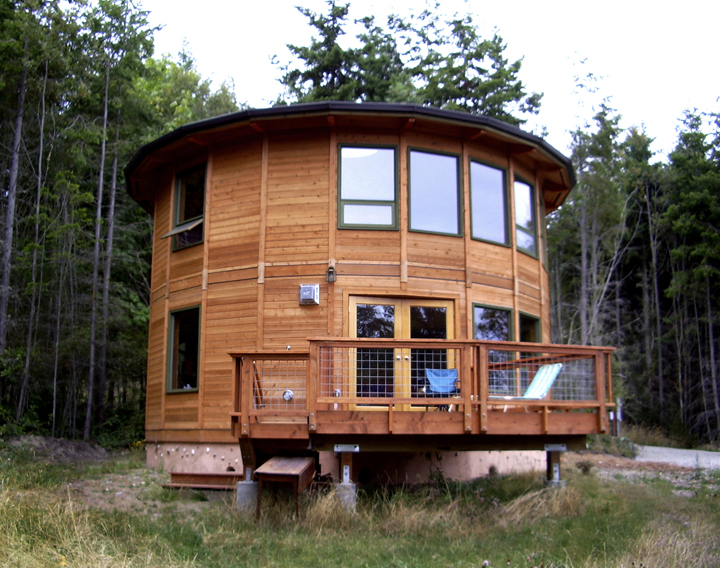 Most "round" homes and domes therefore tend to require room partitions and other accommodations for furnishings, etc., that waste space and energy, offsetting their theoretical benefits. Cultural life-ways and real people are not theoretical or merely in need of structural improvements. Therefore, really great design involves meeting real world challenges for real people with real lives for the best possible mix of fulfilled needs & wants, with the least waste & lest impact on all generations. "Green" now really requires thriving while enabling future generations to thrive as well. That seems to be a pretty good aim of responsible design for the real world of today. Blessings & Cheers - to Our Health & Common Wealth! Several points: 'Square' construction requires materials with high tensile strength like wood logs, boards and/or beams, historically. Or quarried, carved stone lintels. Or reinforced concrete. If all you have to work with is mud, clay, thatch, brush and animal bones and hides, the cone and dome are about the best one can manage to construct and not have the structure collapse of it's own weight. The circle has structural attributes that better distribute loads, making it more durable in high winds, say, or earthquakes. The round building that is pictured has many windows facing out in many different direction which would allow for sunlight to penetrate well into the structure at almost all hours of the day - presuming the windows are on the south side of the structure. In high latitudes and altitudes, maximizing the solar illumination and warming is desirable. 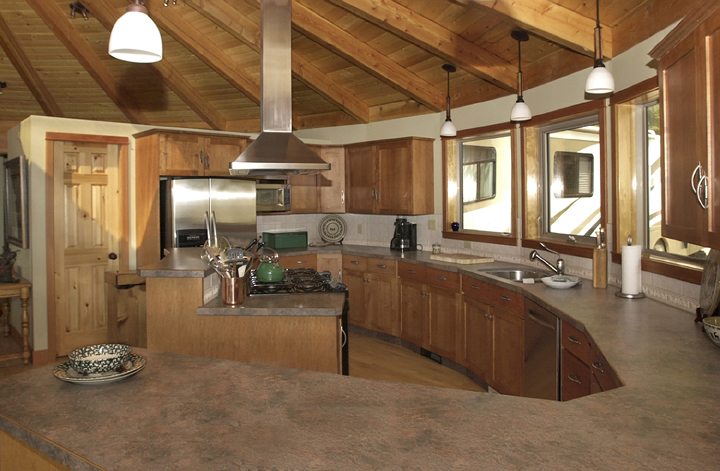 A round-ish floor plan has less heat loss due to having less exterior surface per interior volume to radiate heat. A centralized heat source - a fireplace, a furnace, etc - could radiate the interior more efficiently. The dome or cone shaped roof could guide rising smoke and exhaust gases to the center where it can be exhausted through openings gauged to moderate the flow and retain as much of the heat inside as possible while still ventilating away hazardous emissions. What if we use a round shape in the junctions or nodes? Are they effective ? I'm very sorry. These houses were round just because it was the only way to build them. Please, how do you want to have a rectangular shaped teepee? There were other ancient houses which were rectangular for instance in Egypt, middle East or Europe. Therefore most of the remarks like "Because the ovid shape- egg, earth, tree trunks, stones -- is what they saw reflected in the surrounding natural environment" are stupid, like this article. Only one-room (per floor) round homes actually work from the architectural and Feng Shui viewpoint. When you subdivide the spaces inside with walls you end up with strange angles, and spaces between walls and furniture where dust collects. An article in support of round/curved architecture! I’ve researched this concept within the body of my degree, purely focusing on the benefits of round/curved School Buildings, where the psychology/design and architecture form a union of working parts, like the mechanism of a clock. Looking back through history, the science behind the design supports this idea whilst contributing on a practical level for environmental benefits. I can never understand why schools should become a uniformed lifeless box again, especially when so much information and technology is available. Children will not reach their full potential to explore and grow stuck in an enclosed box! – A square box in a round hole? I am an architect so, keep me posted! A circle is the economic, material-saving brother of a square. You need less material like bricks by a round-shaped building, while using the same amount of area. I grew up in a round house. In our city, it was so unusual, that it was "the" round house. We (as a family) just lost our amazing round house to a reverse mortgage that our now-elderly parents added over a decade ago before they both developed dementia. It was a much more emotional loss than I thought it would be. As a kid, all I wanted was to have a "normal" house like my friends, because ours drew a lot of attention, a lot of strangers just rang the doorbell and asked to look around (that was a big ole "NO" btw), and as soon as someone learned I lived in "That Round House" it was all they wanted to talk about. Now that I\\\'m grown and it\\\'s gone, I miss it. I think these are gorgeous! Just when we think we no it all, only to find out our ancestors had it pegged a thousand years back. Why am I not surprised! A very advanced Shelter I've been working on for years put this compression effect and centerpiece cooling to use. I'm making a downward spiraling biodome of sorts. I agree though, I see anything that's not round/oval as a primitive box. I believe a house also needs to have submerged floors though to complete the funcionality of the dome shape efficiency, a hexagon works best for the sub floors with the correct support system as a round basement would easily cave but a hexagon done right can bounce impact to the adjacent walls. The oldest forms of indigenous shelter were often round in shape. (Think the Southwest USA Hogan, Mongolian Yurt, North American Teepee and the Greek Tenemos, among others.) Why did our ancestors choose to build round? Because the ovid shape -- eggs, earth, tree trunks, and stones -- is what they saw reflected in the surrounding natural environment. And, as usual, Mother Nature knows best. There is some nifty natural science that makes round buildings more comfortable, more energy-efficient and safer -- especially if you combine the ancient shape with modern materials! Circles can be stacked and connected. The same benefits of safety, air and temperature flow apply to a stacked round structure. Why did our ancestors build round? Because the ovid shape- egg, earth, tree trunks, stones -- is what they saw reflected in the surrounding natural environment. The walls around the interconnecting pieces can be infilled with many different materials. Like; strawbale, cordwood, cob, sealed envelope, ICF's, etc. The open circle center can span diameters as small as 16' and as large as 60'. The interior spaces of a round home follow the same patterns. It's possible to combine living areas around the center circle space. People report better sleep, calmer energy, greater harmony and more connection with nature when living or working in a round space. Maybe our ancestors were on to something! Round buildings use less wall, floor and roof mate­ri­als to enclose the same square footage as a rec­tan­gu­lar struc­ture. 15 to 20% less mate­r­ial is used to cre­ate the same square foot build­ing com­pared to a rec­tan­gu­lar design! Air and temperature move naturally in a round space.The ther­mal dynam­ics of open-at-the-top architecture round space uses no external energy to circulate temperature. Roof trusses meet in a center ring, producing inward and outward pressure which holds the roof in a state of compression. Wind and tsunami waves move naturally around a round building rather than getting caught at (and potentially ripping off) corners. 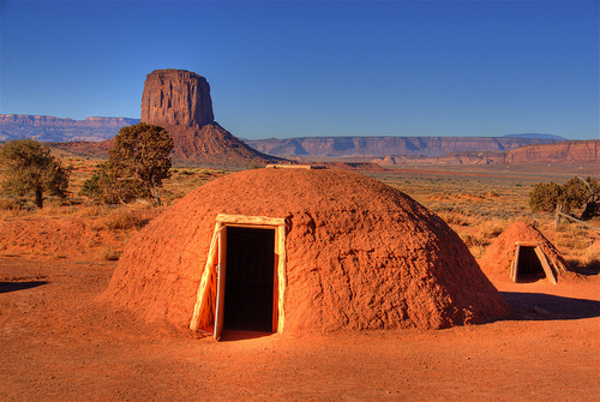 The oldest forms of indigenous shelter were often round in shape. (Think the Southwest USA Hogan, Mongolian Yurt, North American Teepee and the Greek Tenemos, among others.) Why did our ancestors choose to build round? Because the ovid shape -- eggs, earth, tree trunks, and stones -- is what they saw reflected in the surrounding natural environment. And, as usual, Mother Nature knows best. There is some nifty natural science that makes round buildings more comfortable, more energy-efficient and safer -- especially if you combine the ancient shape with modern materials.